Relax, eat and entertain in a vibrant alfresco area created by Venture Outdoor—your outdoor renovations specialists. There are few places better suited to outdoor living than Western Australia. Provided with the opportunity, most West Aussies would eat, drink, relax and play outside all year round. It makes perfect sense to our Perth patios experts! That’s why our top patio builders and outdoor renovations experts are dedicated to creating inviting, versatile alfresco areas specifically designed for our climate and lifestyle. Now more than ever, West Australian homeowners are transforming their gardens into extensions of their living space, where they can happily spend time all seasons of the year. This is what we do best at Venture Outdoor. Venture Outdoor knows West Australian outdoor spaces better than most. From the paving and outdoor decking to the sunroof and shed, we can handle every single aspect of your project, including council approvals. Whether it’s a new build or a patio renovation, a classic flat patio or a pitched gable patio, you can trust us to create the perfect outdoor area for you. We create every single element of your outdoor area so that the only job left for you to do is refill the drinks and light the barbecue. Call today on 0409 980 776 to find out how we can help you. of your project, including council approvals. us to create the perfect outdoor area for you. The Venture Outdoor patios Perth team and outdoor renovations experts are committed to creating customised outdoor areas that suit you, your property and location. We handle every last aspect of a new build or renovation: patios to paving to carports, sheds and landscaping. There’s absolutely no aspect of your project that we can’t handle, and we work closely with our clients to ensure every outdoor area is completed to the highest possible standard, on time and on budget. Being fully conversant with council regulations, we can handle all the red tape and paperwork, leaving you time to relax and get ready to enjoy your new outdoor space. Venture Outdoor really is your one-stop shop for outdoor projects, and we pride ourselves on our commitment to quality. Make the most of your outdoor living space with Venture Outdoor. Venture outdoor did an excellent job of building our carport great professional service. The site was left clean and tidy. We would highly recommend them. Awesome job, Kris. Thank you so much for a beautiful patio! Thank you Kris for a fast, professional and hassle free job. The patio looks great and the guys were very easy to deal with! Venture Outdoor is your number one Stratco Outback® Dealer. With a professional relationship spanning over 8 years Venture Outdoor has now been established as a leading authorised Stratco Outback Dealer. We provide quality installations with a 1-year guarantee on all Stratco Outback® sunroofs, patios and pergolas and a 15-year structural warranty. 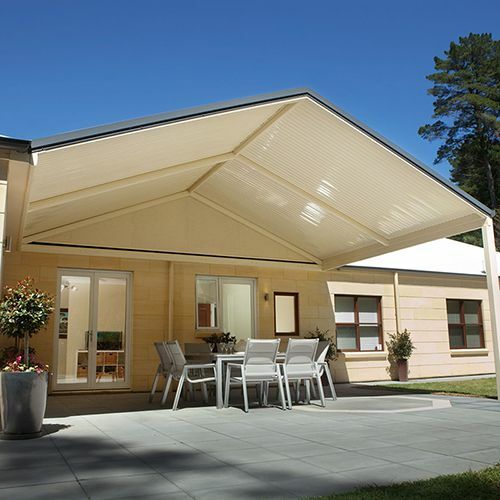 Stratco Outback® range is the highest quality and engineered products on the market, made with all Australian steel. Ask how we can help improve your outdoor entertainment space. Improve your outdoor living space today and pay later. *Conditions apply. See linked page for details.